The following article is a guide to the advanced dynamic settings within a Writer. For a simple dynamic workspace, a user may never need to change these settings from the default. However, if advanced techniques are required (For example, when the desired schema is coming from a table in a database), familiarity with these options will be beneficial. This option specifies which Reader or Workspace Resource should be used to define the schema. 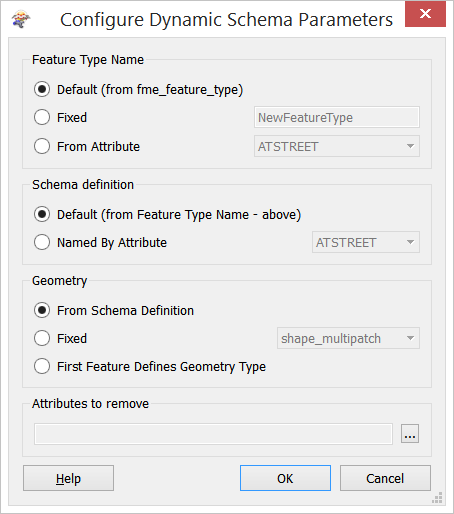 Since the schema is composed of three basic parts: Feature Types, Attributes, and Geometry Types, these settings give more control over the output. By default, each part is obtained from the incoming schema, whether that’s a real Reader or a Resource Reader. Controls the name of the destination feature type to be written. Default: Uses either the source schema or the schema Reader Feature Type name. Fixed: Allows the user to supply a name. From Attribute: Has the same effect as dataset fanout, with a new Feature Type name for each value of the specified attribute. Defines the Reader (or Resource) Feature Type name that will provide the schema. Default: Schema is based on the feature type name. Defines how the geometry type of the feature class is derived. From Schema Definition: Geometry type is derived from the source schema. Fixed: Geometry type is forced to the specified value. (Some formats, such as Esri Shape, have a fixed geometry). First Feature Defines Geometry Type: The first feature to reach the Writer is used to set the geometry type. This option allows for attributes to be removed from the feature. Enter the names of any attributes not wanted in the destination feature (for example, OBJECTID or SHAPE_Area).